^ Ritardando a poco a poco, 2011 by Euan Macdonald. Part of Open-Tuning at the Hayward Project Space, London. Photo by deconcrete. 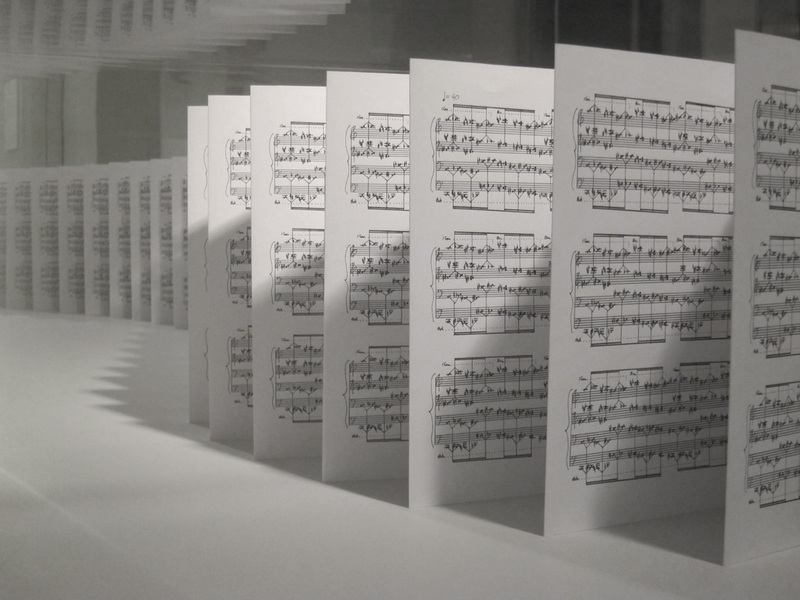 There is an accordion-folded music score standing inside a vitrine, yet not to be touched or performed by anybody. It seems to be composed of 50 pages at least. Melodic? Quite the opposite: noise literally translated into paper. Later I find out that a whole piano has been turned into noise; a machine into a piano; and a factory space in Shanghai into a machine. Paradoxically, the global demand on cheap instruments makes harsh dissonance to be used for reaching optimal quality standards. I move on to the dark room where the annoying noise comes from. And then I watch the video of the simulator running. A piano-like industrial device plays the actual piano. The machine tests the long-term endurance of the instrument by banging all keys almost simultaneously. It goes on and on and on for 5 minutes. The cacophony becomes eventually less annoying and the whole machinery suddenly stops. I go out, look at the music scores again. I imagine the whole space of production in China; pianos being shipped worldwide; everything compressed on the written scores. And I leave. ^ Excerpt from 9,000 pieces, 2010 by Euan Macdonald, commissioned by YBCA.